Today, Google’s front page has a link to an Hour of Code video. 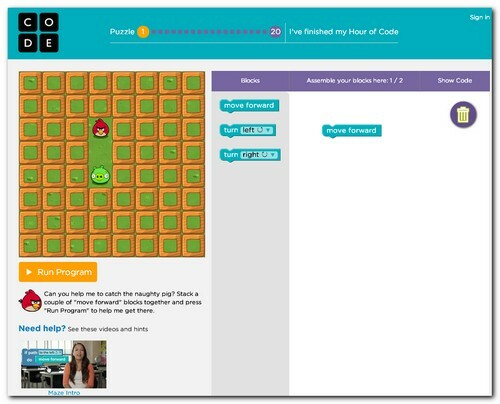 The Hour of Code is a worldwide effort to introduce 10 million people to coding and it’s happening this week (December 9th – 15th). I’ll be presenting an hour of code in both of my sons’ classes at school, and if you’re a developer I encourage you to teach others how to code. If you’re not a developer, you can do work through the tutorials yourself or help your children do it with you using one of the excellent tutorials. If your worried it will be too difficult, don’t be. It’s no harder than playing Angry Birds. Everyone can benefit from learning to program, plus it’s fun! It’s great to see folks like Bill Gates, Mark Zuckerberg and Chris Bosh giving their support to such a worthy cause.